The image of the Top Rank Suite which attracted so much interest from followers of Wearside Echoes. Top memories of a top club. That’s what we got from Echo followers when we posted a 1971 photograph of the Top Rank club on social media. The Beatles who made an appearance in Sunderland. It attracted the interest of more than 36,000 people and more than 130 of you shared your memories. High up on that list was memories of the bands you saw for the first time and what a list that was. Ron Donaldson remembered seeing ‘one of the first ever appearances of Electric Light Orchestra.” He also recalled the first tour of Eddie and the Hot Rods. And what about that triple bill which was on in 1971. Peter Scott led the way and said: “Seen Thin Lizzy, Suzi Quatro and Slade for a £1 at the Rank” and Ian Beckford had similar memories. So did Karen Brown who described them as ‘good memories’. We loved Jennifer Daly’s recollections. Another view of Park Lane in 1971. Jean Hall remembered walking miles ‘round and round the dance floor’ while Edward Mercer had memories of seeing Free supported by Deep Purple ‘and no ear protectors’. Another Wearside Echoes follower Pauline Gibson saw the Beatles there in the 60s. 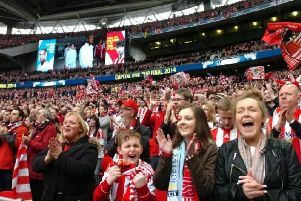 Sunderland at Wembley: 14 of the most magical moments from the Black Cats' last trip to Wembley - here's to making more memories! And William Tatters added: “Yeah wish we could have those days back again, still miss Sunderland.” He said he “had some great nights in the early sixties at the Rink, saw lots of good bands”. Helen Robinson said: “Saw Love Affair here and fainted at Steve Ellie’s feet, ha ha! We loved all of your memories about the Top Rank and would love to hear more. Or perhaps there is another former Wearside club you would like to remember? Get in touch and tell us more. We would also like to hear from people with other memories of Sunderland in times gone by, whether it is about a former club or perhaps a favourite shop, pub or restaurant from times gone by.